Didn’t I tell you a couple of posts ago that I like stuffing things? Well, I’m at it again and for this post I’ve created a stuffing to fill acorn squash halves. Winter squash don’t really excite me much unless they’re really doctored up. Roasted butternut squash? Not so much. Butternut squash ravioli with sage brown butter? Absolutely! I’ve never cooked acorn squash before, but I really like the scalloped shape of them and when stuffed, they serve as the perfect bowl and make a beautiful presentation. And after all, presentation is everything in my book. I’ve posted several recipes with farro and it truly has become my go-to grain these days. Broccoli and Farro Salad with Vidalia Onion Vinaigrette and Farro Caprese Salad are both delicious examples of salads made with this fantastic grain. It’s a very healthful complex carbohydrate with more fiber and protein than most any grain. I particularly like the texture and we’ve mostly replaced brown rice with farro in our diet. Because of its versatility, farro makes a great salad ingredient but is equally delicious in warm dishes. If you’re like most of us, you have some turkey left over from your Thanksgiving feast. Put it to good use in this dish and substitute the ground chicken with turkey. If you choose to make this substitution, simply chop some turkey and add it to the the stuffing mixture at the very end just prior to filling the squash. If you want to eat seasonally, this elegant and self-contained meal makes a healthy and delicious autumn meal. 1. Preheat oven to 375 degrees. Cut a thin slice off the bottom of each squash half so that it will sit upright without tipping over. Place squash halves cut side down on a baking sheet and transfer pan to oven. Bake for 45 minutes or until squash can be pierced with a fork. Remove from oven and set aside to cool. When cooled, scoop out approximately three to four tablespoons of flesh from each squash half. Measure one cup of flesh and mash. 2. While squash is baking, bring chicken stock to a boil in a medium sauce pan. Add farro, reduce heat to a simmer, and cook covered for 20 to 25 minutes or until farro is firm but tender. Remove from heat and drain if any liquid remains. Set aside. 3. Blanch kale in a pot of salted water for three to four minutes. Drain in a colander, rinse with cold water, squeeze to remove excess water. Chop kale and set aside. 4. Heat two tablespoons of olive oil in a medium skillet over medium high heat. Add onion and garlic and saute for two to three minutes. Add ground chicken and break up with a spatula. Continue cooking until chicken is browning. 5. 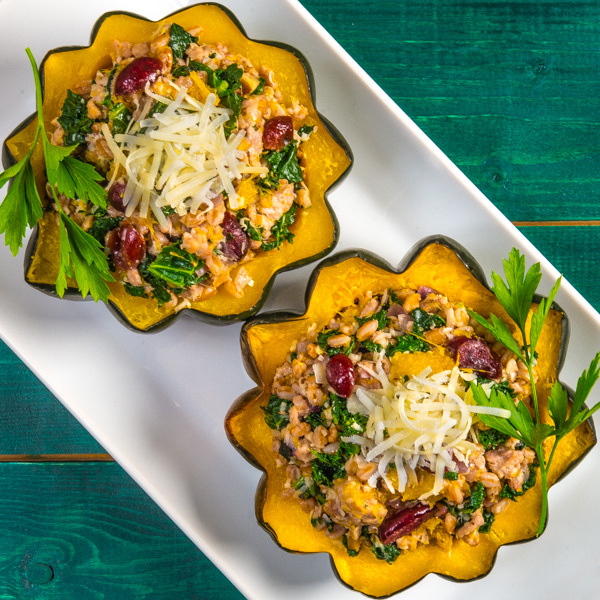 Remove from heat and add one cup mashed squash flesh, farro, kale, cranberries, pecans, salt, pepper, oregano, thyme and Parmesan cheese. Toss thoroughly until well combined. 6. Divide stuffing evenly between six squash halves. Drizzle each with additional olive oil. Place squashes on a baking sheet and transfer to oven. Bake for 15 to 20 minutes or until warm through. Garnish with additional Parmesan cheese and serve immediately. This looks fantastic! Definitely on my must make list. I have always been a huge squash eater. I think that comes from the fact that my mom always served it with brown sugar and butter! But doctoring it up this way may encourage the rest of my family to dig in too. I happen to have a couple of acorn squashes on the counter from our CSA right now. My mother didn’t cook much squash when I was growing up and winter squash have never been my favorite food (except spaghetti squash). I think I liked the stuffing more that the squash part! 🙂 Hope you and your family have great holidays! This looks absolutely gorgeous! Love all the fresh colors happening here! Thank you, Pamela! I appreciate the visit and the comment! Glad to find your blog too! I love stuffing things too! And you’re right about the beautiful scalloped edges of the acorn squash. I do like acorn squash but it didn’t go well with the children, I think I should stuff it. I always like colorful food, Nazneen! I appreciate your visit and thanks for leaving a comment. I’ll be checking out your blog! Gorgeous, just absolutely gorgeous. Seriously great way to make acorn squash. Pinned and shared. Thank you, Renee! I appreciate your support! Happy holidays! Acorn squash is one of my favorites – love its flavor. But I’ll turn down no squash. 😉 Stuffed squash is such a nice dish, and yours is particularly gorgeous. Really good job – thanks. Thanks for the compliment, John. Hope you guys have great holidays! Bill – this is a beautiful dish! I love ALL types of squash, cooked any which way – but your stuffed version takes my idea of squash to a whole new level! What an amazing array of colors and textures and flavors! I always love reading your comments, Shashi! Thanks for the visit! Acorn squash does look so gorgeous when stuffed, never done that and I can’t to stuff it sometime. Beautiful stuffing, the farro is such a hearty grain and paired with the vinaigrette, seems like such a tasty dish. Hope you had a great Thanksgiving and have a great weekend. Thanks so much, Ash! I appreciate you dropping by and I always look forward to your next post! Oh wow that is so stunning!!! Thank you Jocelyn! I appreciate the compliment. Happy holidays to you and your family! I can’t believe I have been eating acorn squash all my life and never thought of stuffing them (except with butter and brown sugar). I am definitely making this maybe without the chicken. I also am putting your chicken sausage kale and bean soup on the to make soon list..If you ever find a delicata squash they are delish. Look at the colors, flavors and textures in this acorn squash. Beautiful. Thank you, Velva. I appreciate your support!